On the morning of May 26, 2013, Her Royal Highness The Princess Royal arrived in Liverpool to participate in two events commemorating the 70th anniversary of the Battle of the Atlantic. First, the princess placed a wreath at the British Merchant Navy Memorial at the Liverpool Pier. 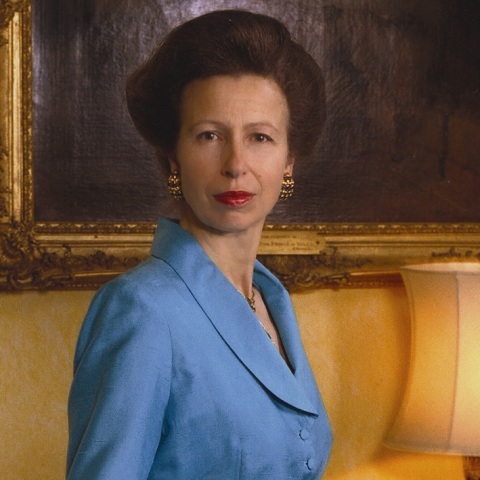 From there The Princess Royal along with her husband, Vice Admiral Sir Timothy Laurence, hundreds of World War II veterans, families, and friends attended a Service of Remembrance held at the Liverpool Cathedral. To learn more about the Battle of the Atlantic please click here and here. Please click the links to watch videos as well as to view photos from today’s important event. 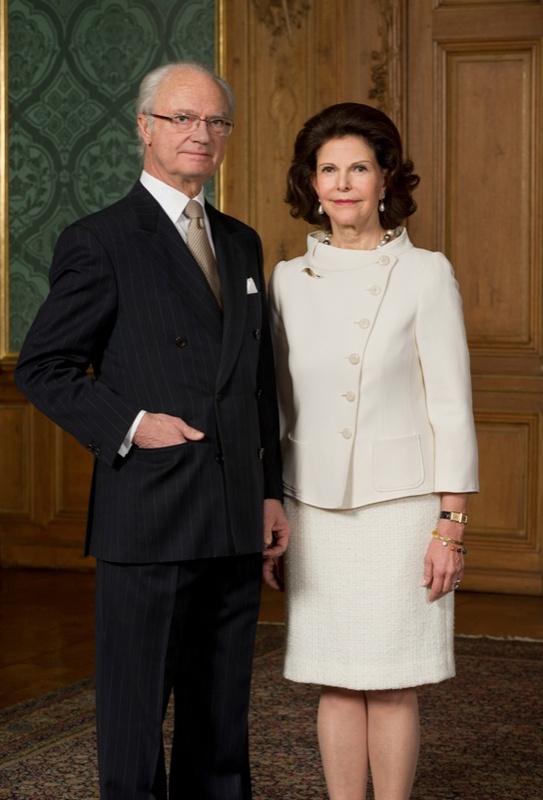 News Regarding Their Majesties King Carl XVI Gustaf and Queen Silvia of Sweden. On Saturday, May 25, 2013, Their Majesties King Carl XVI Gustaf and Queen Silvia of Sweden with a surprise appearance by His Royal Highness Prince Henrik of Denmark arrived at the Östasiatiska Museet in Stockholm to attend the inauguration of two exhibitions entitled, Gustaf VI Adolfs Gåva till Svenska Folket and Krigardrottningen och Kinas Bronsålder. For more information about the exhibitions please click here. 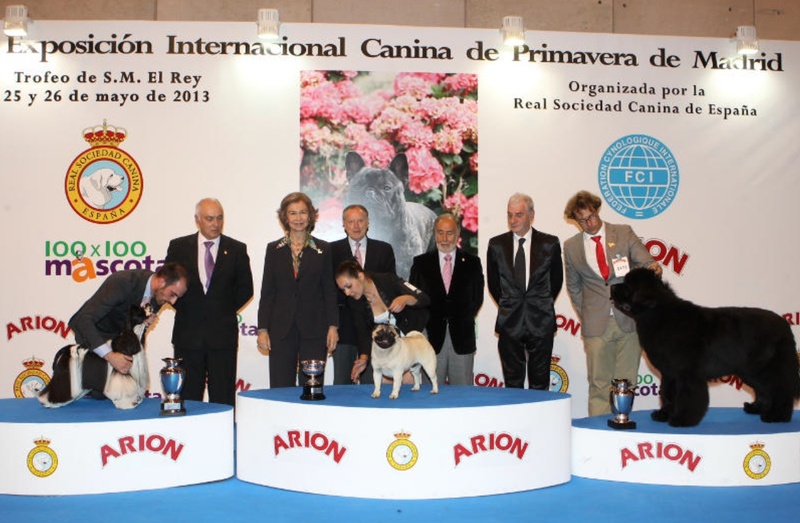 Her Majesty Queen Sofia of Spain Attends the 85th Exposición Internacional Canina de Primavera. Anyway, during today’s event Her Majesty presented the top award, the Trofeo de S.M. el Rey (Best in Show) to a super cute little doggie. So what breed won? The Pug. On Sunday, May 26, 2013, Her Highness Princess Ameerah Al-Taweel of Saudi Arabia participated in the plenary session entitled, The Business Case for Gender Diversity, during the 2013 World Economic Forum on the Middle East and North Africa. Click here to watch a video from today’s session. 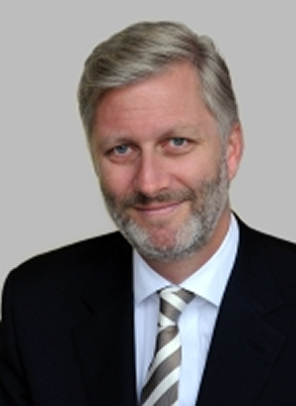 This morning in cloudy and cold Brussels His Royal Highness Prince Philippe of Belgium along with 37,000 of his closest friends participated in the 20 km de Bruxelles race. Click here and here to watch videos as well as to view photos from today’s race. On the morning of May 26, 2013, Her Majesty Queen Rania of Jordan participated in the plenary session entitled, A New Vision for Arab Employment, during the 2013 World Economic Forum on the Middle East and North Africa held at the King Hussein bin Talal Convention Center, Dead Sea, in Jordan. Please click here to watch and listen to Her Majesty’s opening speech. Her Majesty also met with “…members of the Young Global Leaders who briefed her about their participation in the World Economic Forum and the outcomes of their visits to a number of community development projects in Jordan…” according to Petra News. Later in the afternoon, the crown prince accompanied his father, His Majesty King Abdullah II of Jordan, to inaugurate the new $100 million Dead Sea Crowne Plaza Hotel and Resort. After the opening His Majesty and the crown prince were given a tour of the new resort and met with the staff. Afterward, His Majesty King Abdullah II and Crown Prince Hussein met with various government and world leaders attending the 2013 World Economic Forum on the Middle East and North Africa including the United States Secretary of State, Mr. John Kerry, and the President of Israel, Mr. Shimon Peres. And, finally this evening, His Majesty and Crown Prince Hussein participated in the closing plenary session and award ceremony of the 2013 World Economic Forum on the Middle East and North Africa. During the event His Majesty gave a speech in which he called for “…peace in the Middle East and global support for Syrian refugees…” His Majesty also presented the King Abdullah II Award for Youth Innovation and Achievement to several worthy recipients. Fun Times at the 2013 Grand Prix de Monaco for Their Serene Highnesses Prince Albert II and Princess Charlene of Monaco. On Sunday, May 26, 2013, Their Serene Highnesses Prince Albert II and Princess Charlene of Monaco accompanied by Mr. Andrea Casiraghi and his beautiful fiancée, Miss Tatiana Santo Domingo, Mr. Pierre Casiraghi and his lovely longtime girlfriend, Miss Beatrice Borromeo, attended the 2013 Grand Prix de Monaco held on the Circuit de Monaco in Monte-Carlo. The princely couple cheered on as German-born Monaco raised, Mr. Nico Rosberg from Team Mercedes AMG PETRONAS Formula One, dominated over Formula One favorite, Mr. Sebastian Vettel of Team Red Bull Renault and Mr. Mark Webber also from Team Red Bull Renault. Today’s victory for Mr. Rosberg was quite sentimental for the young driver. 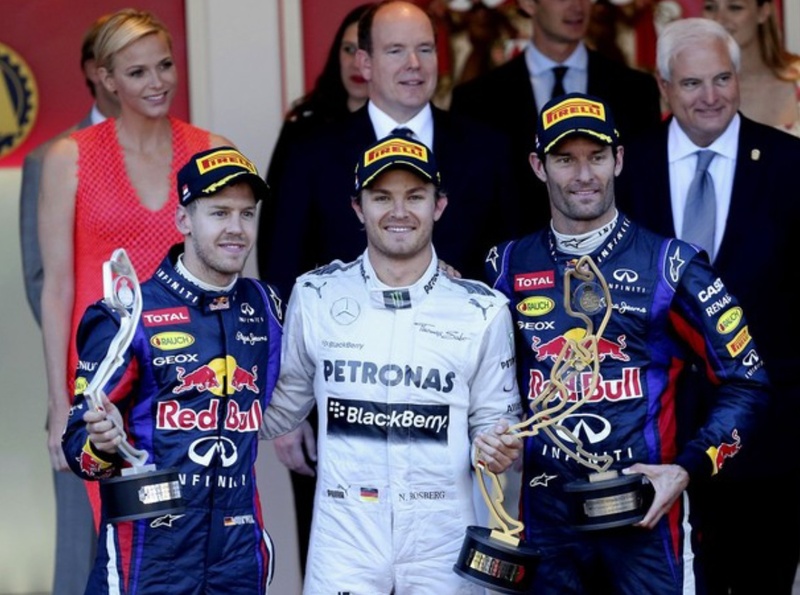 In 1992, his father, Mr. Keke Rosberg, won the Grand Prix de Monaco. So, yeah, it’s quite special. 🙂 Click here to view highlights from today’s race (scroll down and on your right hand side click the videos below where it says NBC Sports Videos). Anyway, prior to this afternoon’s race Prince Albert II and Princess Charlene completed the traditional drive around the Circuit de Monaco in front of thousands happy grand prix attendees including director Ron Howard, actress Cameron Diaz, and Baywatch star and overall has been, Mr. David Hasselhoff to name a few. And, last evening the princely couple hosted a lovely reception at the Palais Princier for various VIPs attending the Grand Prix de Monaco. The sovereign prince also attended TAG Heuer’s 2013 Monaco Grand Prix soiree — somewhere in Monaco — alongside hundreds of beautiful people in fancy clothes.